In a brazen smash-and-grab captured on security cameras, 2 thieves stole a 17th century gold ingot from the Mel Fisher Maritime Museum on Key West, Florida. 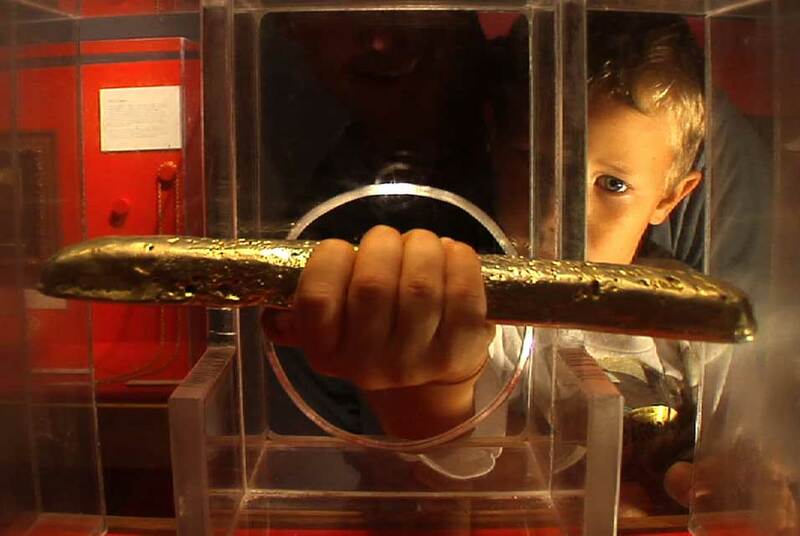 The 11-inch, 74.85-ounce gold bar was kept in a bulletproof polymer case that had a hole in it so visitors to the museum could put their hand in and hold the bar. Somehow one of the thieves managed to break through the case, lift out the bar and walk casually out the door with the ingot in his pocket. The security footage (which you can see in this CNN video) doesn’t show how they broke through bulletproof plastic. I can’t detect a weapon or device of any kind. It looks like he just reaches in and pulls out the gold bar, but they had to bust up the case to do it. The ingot was found in 1980 by famed treasure hunter Mel Fisher. He and his team were looking for the wreck of the Nuestra Senora de Atocha galleon, a treasure ship that left Havana in 1622 along with a fleet of 27 other ships crammed to the rafters with New World booty only to be felled by a hurricane. Instead he found the wreck of one of the other 7 ships from that treasure fleet which went down in the storm: the Santa Margarita. The gold ingot was one of the more dramatic pieces Fisher recovered from the Santa Margarita. Not only is it a large and handsome, but it has a variety of unique markers including Roman numerals marking it as 16-karat gold, a symbol identifying its owner, and dots indicating the taxes paid on it to the Spanish crown. Its estimated value is $550,000, but the weight of the gold alone is worth $75,000. The museum is offering a $10,000 reward for its return. Here’s hoping the bastards don’t just melt it down and smoke 70 grand worth of meth.